It’s one of those classic stories, the Rev. Bill Murray of Saint Michael and All Angels prefaced as he explained how the church got its latest art installment. “A member of the parish called one day and said, ‘I have some art for you,’ and I thought, ‘Oh, boy, here we go,” he laughed. It all began a couple of years ago when a daughter returned home to Dallas to visit her father. At the time, Laura Finlay Smith said she was a little frustrated about some artwork her company had out on loan to a local museum. “It had been in crates for years,” she said about an installment called Via Cruces that was just too large for the museum to hang. 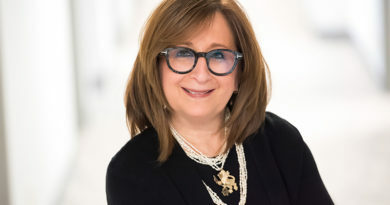 “I was grappling with shipping these pieces back to Santa Fe and whether or not there was a closer opportunity. The art just so happened to be one of two castings of the 14 Stations of the Cross sculptures commissioned for the Basilica of the Pantheon in Rome. Smith’s father, Richard Finlay, knew of the perfect place. 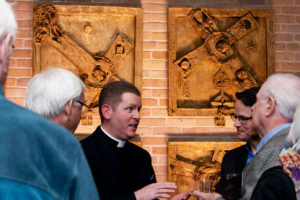 During those early conversations, both Finlay and the reverend didn’t know much about the significance of the artwork. It wasn’t until they sat down in a church office and read a book about Via Crucis. The prominence of the art, Murray said, is spectacular. Via Crucis (Stations of the Cross) was commissioned on May 13, 2009, to commemorate the 1,400th anniversary of the dedication to Christianity of the Basilica of the Pantheon in Rome by the Chapter of Canons of the Roman Catholic Church. 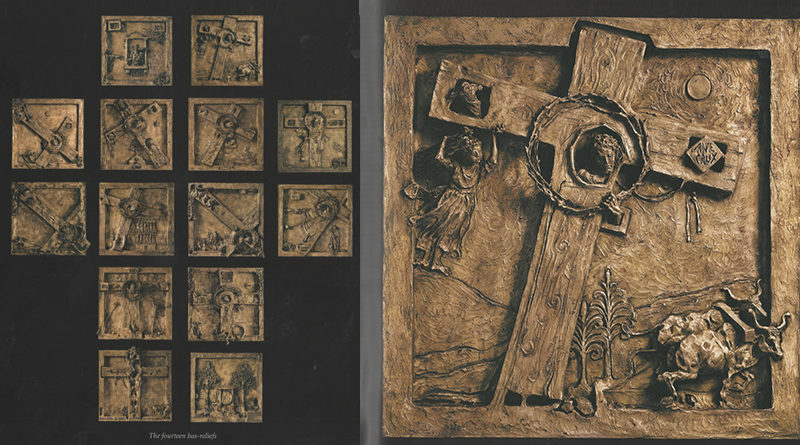 Italian artist Federico Severino created the work, and two copies of the 14 bronze bas-reliefs of the Stations of the Cross were cast. One of those sets was installed in the Rotunda of the Pantheon in 2010. Via Crucis follow Christ’s journey from being condemned and then crucified and buried. There are different steps along the way that help the viewer reflect on that last journey and Christ’s sacrifice for humanity. The two men and Finlay’s daughter worked hard together to get the art to Saint Michael’s, but by the time all of the logistics came together, Finlay was in the hospital and in pretty bad shape.